I've been wanting to make a concave board for quite awhile now. Blackfern keeps evolving and I need to do the same as a shaper. The outline is playful and balanced- wide point just an inch or so north of center. I spent nearly twice as long shaping her as any other shortboard I would normally make. I'll omit the details but essentially you've got to switch the normal progression of shaping and do the deck last(ish). The stringer thickness is about 2 3/16th but out toward the rails the foam is closer to 2 1/2. In other words, there's a little over 1/4 inch concavity at the center of the deck. Doesn't seem like a whole lot but considering that most of my shapes usually have a solid dome (convex) shape to them, I imagine it will feel noticeably different in the water. So what's up with the concave deck? I haven't ridden one so I can't say from experience but the thinking behind deck concavity is this: Your toes and heels have a ramp to (leverage) push against, making the board more responsive. Riders report having a better sense of balance which they attribute to "being closer to the water." Finally, the deck fits more ergonomically to your chest so you can paddle more comfortably. After reading so many strong testimonials, I slated some time over SPRING BREAK to shape one up. Onward to Glassing! 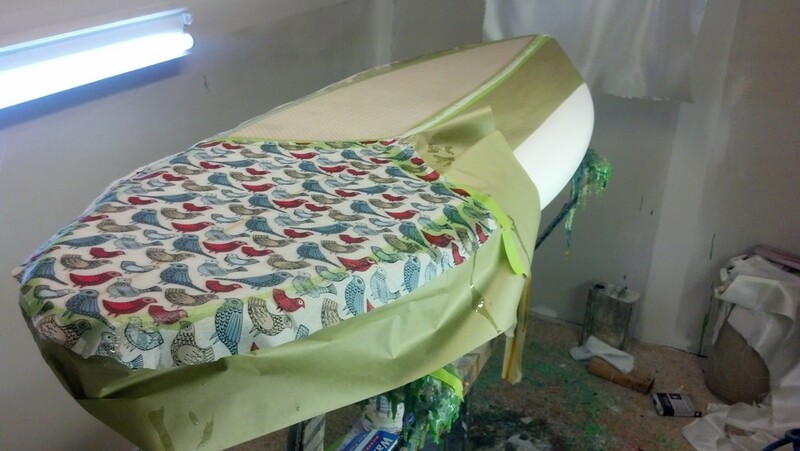 Sarah and I have been browsing Dead Kook's boards lately and got inspired by all the fabric work they do in their boards. After spending way too long browsing around Fabric Depot, we ended up with some nautical birdies and a simple dotted pattern, which I arranged into triforce looking thing. To highlight the red birds and to tie the look of the board together, I added a red resin tint to the whole bottom of the board. I wasn't super happy with the color of the first bottom tint so I went back over the rails with another 4oz layer and made it a darker shade of red. I'm really happy that it turned out that way because I dig the broken up colors on the bottom. The red really pops though! Haven't done too many red boards to date but this is definitely the most vibrant one. And here's the finished product. Quite a unique looking board. Dims are 5'8" x 20" x some arbitrary thickness that's tough to pin down because of the deck concavity. I'm really hoping I can keep this one for myself! Ever-so curious to see how she rides. Posted on March 31, 2014 by Mike Hall.